This is my newest farrowing setup. Last winter/spring when I had all that trouble in March with snow and cold, I decided I would try putting the farrowing huts inside a hoop barn. You can see by the ice on the bottom of the closest hut that it’s still cold in there, but I shouldn’t have as much of a moisture problem as I did outside in the snow and cold. 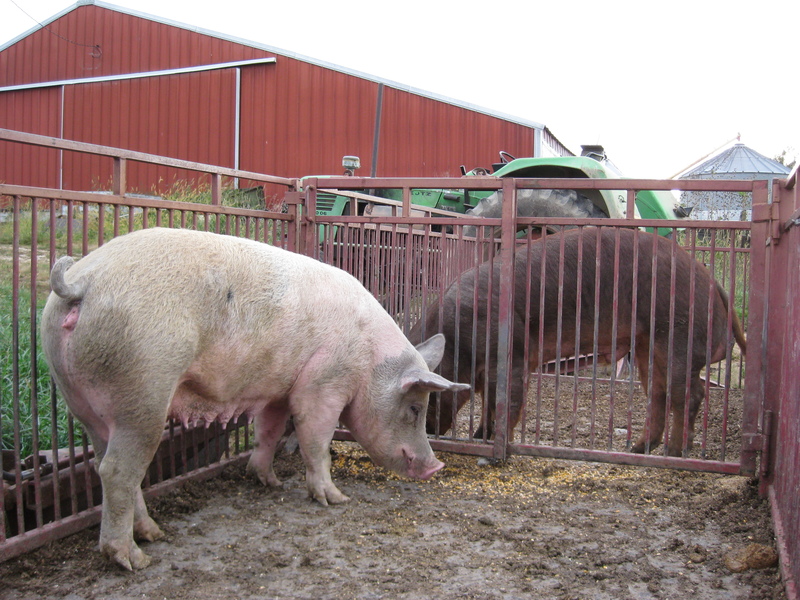 The warm, dry months of July, August , and September are ideal for farrowing outside. 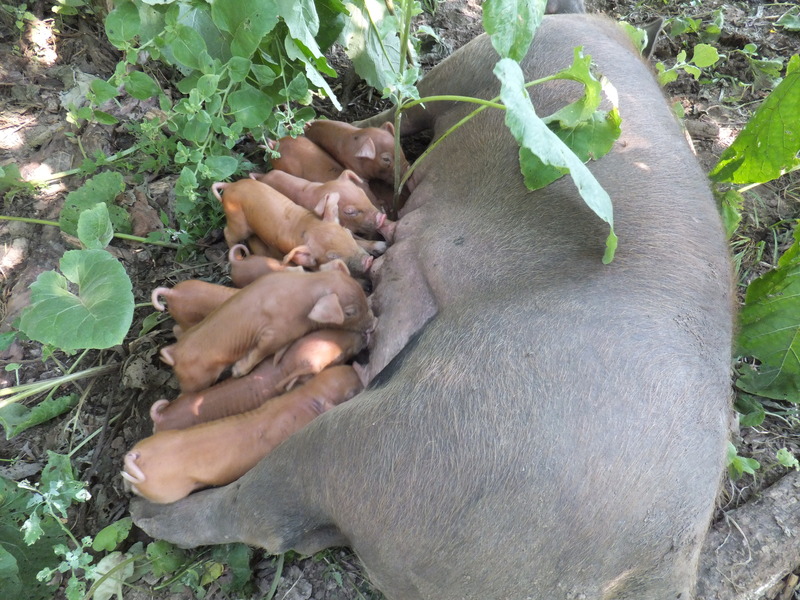 I’m convinced that if sows had plenty of space and material to build their own nests, no predator problems, and feed and water, a farmer could do absolutely nothing and would average over 8 piglets weaned per litter during this perfect time. Farrowing in huts on frozen ground with snow and ice surrounding is what I tried last winter/spring. I managed to wean 7 piglets per litter, but it took tons of bedding and manual work and was stressful. 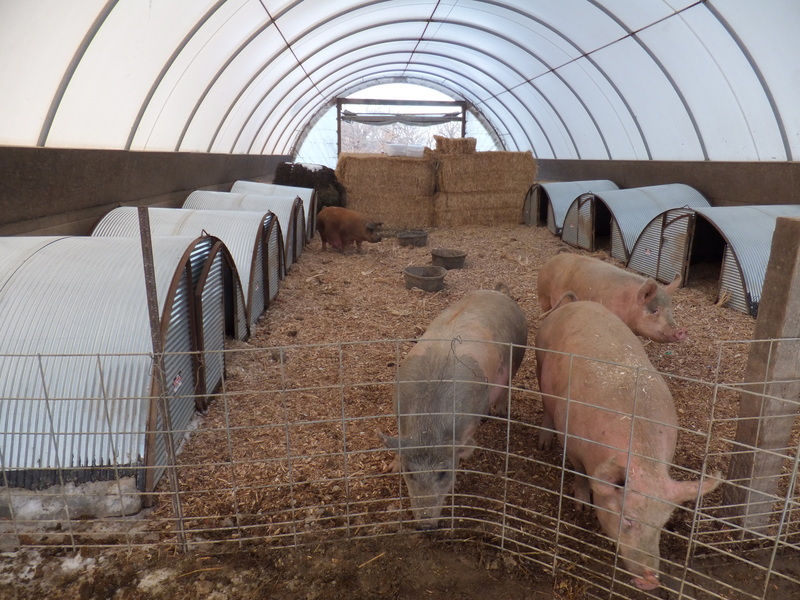 Farrowing in huts in the warmer months is easier than when it’s cold. I probably sleep the best with this method as I know if a sow and her litter is in a hut with a roller on the door to keep the piglets in, they are safe from predators and the elements. Finally, farrowing in a hoop barn with homemade pens is the first method I tried in January of 2012. This worked surprisingly well except for a couple of litters born when the temperature dipped to zero F. I made temporary pens out of wire hog panels, giving the sows plenty of space, removing the panels when the piglets were a couple of weeks old. It was quite a bit of work, letting the sows out of their pens for feed and water twice a day, but it was a nice environment for the pigs and the farmer. So putting huts inside a hoop barn is my fifth iteration. I plan to use this system only until mid-spring, then I will go to huts outside. As always, I plan to keep statistics and share the results by the end of the year. We pregnancy-checked my parents’ spring-calving cows a few weeks ago. Cow 521 came up open. I have always liked this cow and I posted a picture of her a couple of years ago, shown below. 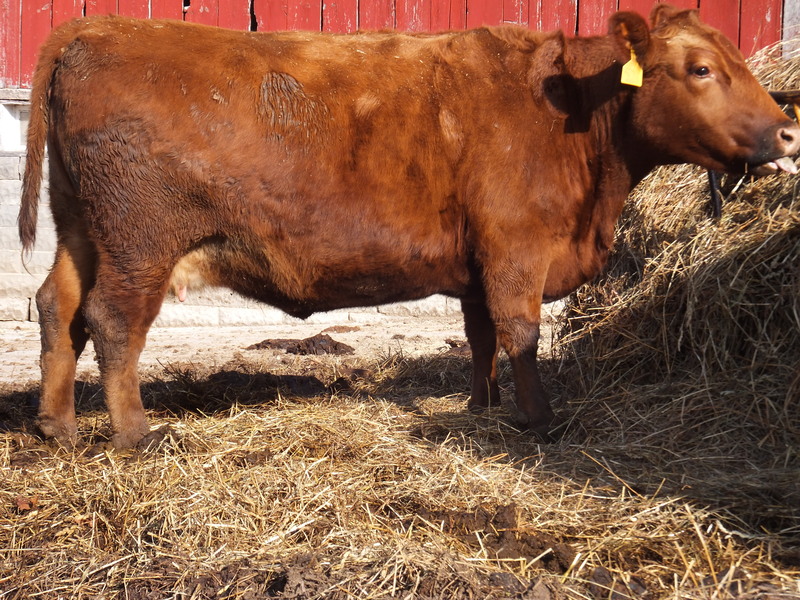 I am tempted to add her to my fall-calving herd which is in the midst of breeding season now, but instead I chose to buy cow 447, which the vet said he thought may be pregnant, but only a month along. 447 is a better bet than 521 because it’s unknown why 521 is open. She may have reproductive problems which render her infertile. Still, it’s sad to see her go. 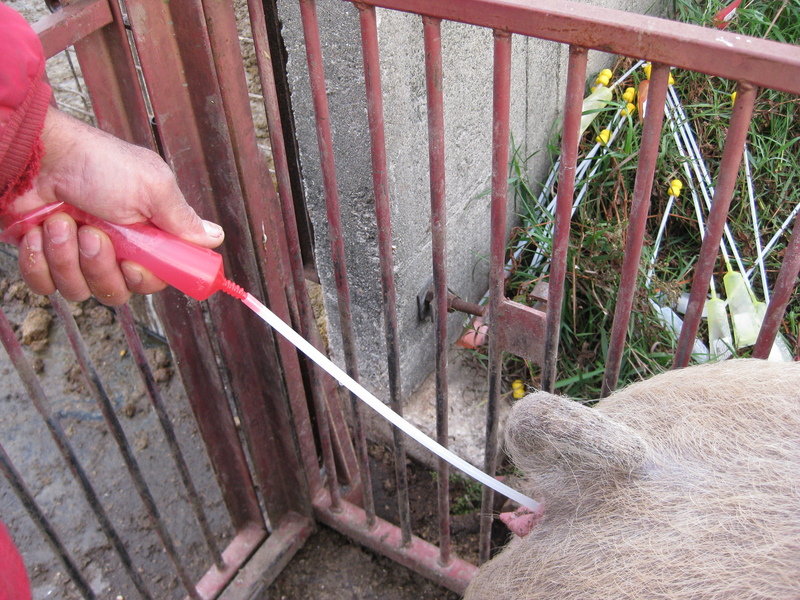 I wrote about how we use Artificial Insemination to bring new genetics into our swineherd in one of my very first posts, “Artificial Insemination of Swine.” Click on the link if you want to read about our AI protocol. I didn’t use any pictures in the beginning, because I didn’t have access to a camera. My sister bought us a digital camera, and I’ve loved it. So easy. When we AI’d some sows in October, I snapped a few photos. 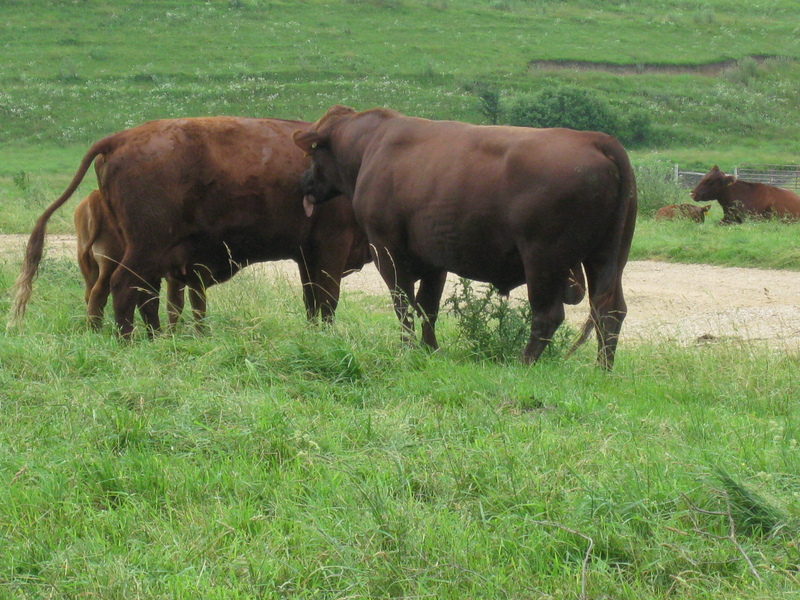 My early July post, “Breeding Season Starts”, was full of optimism. 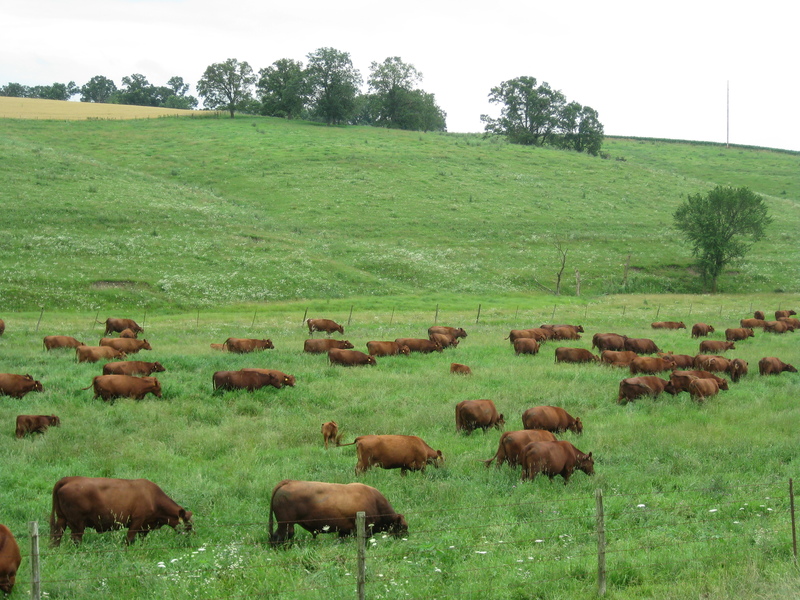 We started breeding season with five, virile bulls, breeding 131 beautiful cows. We now have one, extremely popular bull, with 131 cows. The bull in the bottom of the picture above, “New Chapter”, fought with the other bulls instead of breeding the cows. We took him to market after he hurt the other five-year-old bull, “New York.” “New York” is refusing to rejoin the herd and is recovering his confidence in the back pasture. “Red Direction” and “Judge” are lame and limping along with the herd. But “Julius”, “Julius” is thriving! Look at him in action! Even though he’s busy, he still makes each cow feel special after he puts a kink in her tail. We’ve kicked around some options to make sure the cows get bred. 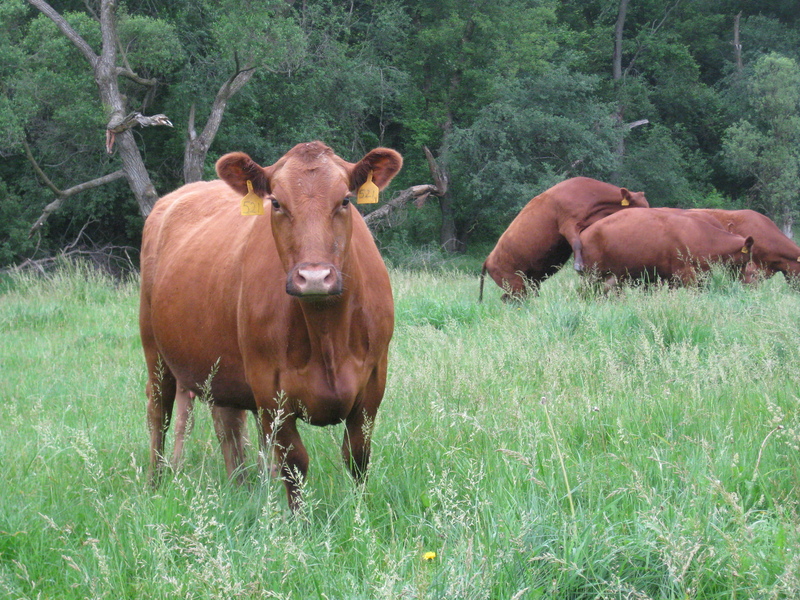 We could take the yearling bulls out of the heifer pasture and put them with the cows. We could buy bulls, but we may not find quality bulls on short notice. We’ve decided to watch and wait. We aren’t seeing many cows “in heat” now. We think the bulls settled many of the cows during the first heat cycle. A cow’s cycle is 21 days. We are nearing the end of the 2nd heat cycle, so a decision needs to be made because the 3rd cycle is their last chance to get bred. All cows that don’t breed are butchered. We won’t know for sure what percentage of the cows are bred until November when a veterinarian pregnancy checks them. I’ll let you know how we did, then. You are currently browsing the archives for the Curious reproduction category.